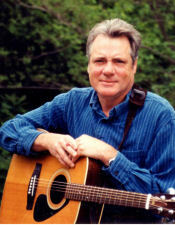 A self-defined old-fashioned guy, Steve Warner’s songs are spiked with unique places, characters and themes . . . with generous portions of nostalgia and humor. Many of his songs strike a universal emotional chord with listeners. He’s been published in Nashville and covered by several indie artist, including a cut that features original members of Hank Williams’ Drifting Cowboys. Warner has also won numerous awards for his songs and has been featured on radio and cable TV. In 2004 he was commissioned to write and record a centennial song for Rotary International as a regional fundraising project. Steve performs his blend of country-tinged folk, often with his trio, The Rolling Coyotes. They have performed at Glen Burnie Gardens, Harpers Ferry Olde Tyme Christmas, Washington County Arts Council Gallery Concerts, House in the Woods, the Kensington Coffee House, the Red Guitar, Leesburg First Night and many other fine listening venues. He has also shared the stage with such prominent artists as David Roth, Scott Ainsle, Penny Nichols, Steve Gillette and Eric Garrison. Warner has been featured at major events such as the Country Roads Folk Festival, the Mountain Stage NewSong Festival, the West Virginia Wine Festival and the Jefferson County Fair. He also teaches and coaches songwriting at Summersongs, an annual song camp in the Catskills of New York. He’s conducted songwriting workshops and serves as a judge and coordinator for the Mountain Stage NewSong Festival held annually in West Virginia’s eastern panhandle. Steve has two CD’s, both available at cdbaby.com. Check out this site for reviews and soundbites. Songs from his most recent CD, Renaissance Man, are getting airplay in several countries.